This article looks at how the ModuleWorks Dental component is being used in the Dental manufacturing sector to reduce lead time and costs while improving efficiency. The ModuleWorks library is tailored specifically for the dental industry and provides high performance 3-5 Axis machining coupled with fully featured Machine Simulation. 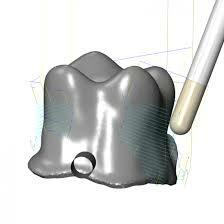 Recent years have seen many advances in the use of CAD/CAM software in the dental industry. It is now routinely usedfor the manufacture of copings, crowns, inlays, veneers, bridges and dental implants. CAD/CAM has dramatically shortened lead times, from days or even weeks to a matter of hours. The ModuleWorks dental R&D team is focused on helping its dental partners keep ahead of the competition by providing innovative toolpath technology to minimize milling time and maximize tool life while maintaining high quality surface finish. Some recent developments have been targeting the machining of the undercut regions often found on dental part geometry. Limitations in angular velocity mean that not all machine tools can efficiently use simultaneous 5-Axis milling across the entire component. For these types of machine, indexed undercut milling can produce substantial time savings. The ModuleWorks dental component will automatically detect undercut regions and calculate the optimal machining direction for each area. In the dental industry there is an increased focus on Vitablocs and e.max materials. ModuleWorks is developing dedicated rotary and 5-axis toolpath strategies for the efficient millingof fully sintered glass-ceramic material. These toolpaths are optimized for maximum material removal without inducing surface flaws or degrading strength of the finished component. The ModuleWorks Dental component allows vendors to create powerful and flexible solutions for dental applications with powerful machining strategies and state-of-the-art simulation. Key benefits are that time to market is much reduced and our technology is industry proven and in daily use for manufacturing all over the world.